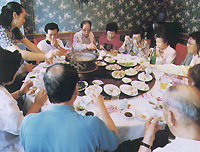 Liaoning Cuisine, developed on the basis of Shandong Cuisine, is well known for its unique style. It integrates the quintessence of imperial dishes that spread far and wide among folks and rare dishes of various ethnic groups in China. Thanks to meticulously selected materials and highly skilled preparations, Liaoning Cuisine is well known for its unique colors, aromas and tastes and is spoken highly by Chinese and foreign gourmets. Famous dishes include Manchou and Han Banquet, Dalian Seafood, Laobian Jiaozi (dumplings), and Haicheng Meat Pies. Zhang Xueliang, a famous patriotic general. spoke highly of four dishes, namely Stir-fried Kidneys, Stir-fried Liver, Fried Meatballs and Stir Fried Day Lilies. Hou Baolin, a famous artist of cross talks, thought Laobian Jiaozi dumplings the most delicious.